I avoid reviewing rare beers on the site as I don’t want to tease people with what I’m drinking, that’s what Untappd and Twitter are for. However, I’m making two exceptions this week since both Founders CBS and Sam Adam’s Utopias are mind blowingly expensive, hard to get, and highly hyped. I also wanted to get more value out of these beers and help people know what to expect and whether they should pull the trigger and buy it. THE TOOLS Truly the epitome of brewing’s two thousand year evolution, Utopias® is a blend of batches, some having been aged up to 19 years in our Boston Brewery, in a variety of barrels. For this brew, the barrels are quite literally an ingredient, with different barrels producing intense layers of flavor that continue to unfold with each sip. We began by using Jack Daniels barrels, but have continued to add to the array with Port pipes, bourbon barrels, congnac casks, sherry barrels, and most recently rum barrels. THE TRADE Samuel Adams® Utopias® is brewed in small limited batches, each their own blend of different vintages. 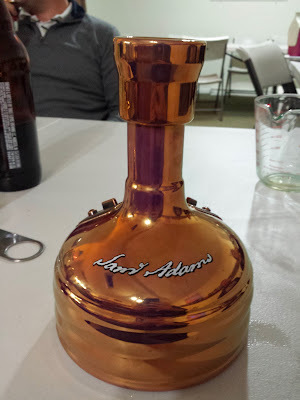 We brew Utopias® at a very high gravity using a wide variety of malted barley and a touch of maple syrup. It is then aged in a blend of scotch, bourbon, port and cognac casks from the award-winning Buffalo Trace Distillery. THE LEGACY Samuel Adams® Utopias® actually began with our first experiments with aging and blending in barrels with the creation of Triple Bock® followed by Millenium®. It was with these brews that we began testing aging beer in barrels from various origins like bourbon, port, and cognac to discover each of their flavor contributions. Inspired by whiskey makers, we took the barrel aging process for Utopias® to another level by utilizing a variety of barrels and blending different vintages to create a truly unique taste experience. Looks just like a flat soda. Which is to say dark brown, good clarity, and no head. The aroma had a strong alcohol heat to it just like you’d get off a glass of any liquor. Behind that heat was some great sweetness with signs of maple syrup and brown sugar. Very first taste is maple syrup which is quite delicious but sadly fades fast. That gets followed by more alcohol heat, sherry, some sweetness, maybe a touch of honey and roasted malt. Carbonation is flat as water but the body has a medium heft to it. Did I enjoy this? Not really. Am I glad I did it? Heck yeah, just to cross it off the bucket list. If you do end up picking up a bottle of this I would strongly recommend letting it sit for as long as you can. Leave it in its box and shove it under some other box in some corner of the closet you never go in. That’ll give plenty of time for the alcohol heat to die down and fade away which will hopefully let more of the other flavors and aromas shine through.